Reddit’s a dangerous place. You can just be chilling out there, chatting it up with your cuber friends on the Speedcubing subreddit, when a single wrong click can lead you right into the middle of a Photoshop battle. Those battles can be brutal, both for comedy and for photograph rights, but they can also be the exact kind of frothy, brainless internet hi-jinks that are both the solution to and cause of most of today’s problems. 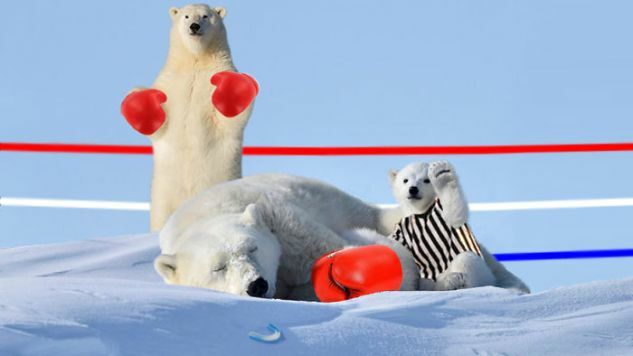 A fine recent example involves this sweet young polar bear, a hail fellow well met who jovially greeted photographer Philip Marazzi one fine morn. (It might have been the afternoon, or even the night—the sun always shines on the polar bear kingdom, except for the half of the year when it doesn’t.) Marazzi’s original, untouched photo, which was a finalist for the 2016 Comedy Wildlife Photography Awards, can be seen here. Once Reddit got its hands on it, the thing was all jumbled and cut up and merged and sorted and recombined with various other photos and references, both historical and pop cultural, to form these things collected here today. It was a battle, and these are the spoils, and we’ll leave it to you to decide if anybody anywhere is a victor in this situation. Well, Marazzi obviously is. He’s a skilled nature photographer who got waved at by a polar bear cub. He was one of the very few, anywhere in the world, who maybe had a good 2016. Congrats, Philip! We’ve shared a small handful of the best photoshops here with you today, and if you want to find more, you can take a look over at the website Reddit.